The buildings still standing at Pagan are impressive, not only in their numbers but also in their architectural techniques, size, decoration, and creative floor plans. This leads logically to an expectation that there would also be a vast number of extant images since each temple would have had at least one major cult image and no doubt several secondary images. Surely, there would have been also an abundance of small images for personal use in household shrines during a prosperous period of more than two hundred years. Alas, that is not the case. Other than images that have remained within the temples, there are relatively few images extant from the Pagan Period numbering in the hundreds rather than the thousands. One of the peculiarities of Buddhist sculpture is that the most important event in the Buddha’s life from the point of view of mankind is not the event most frequently represented in sculpture. Depiction of the Buddha's personal enlightenment vastly outnumber representations of all other events in his life including that of his first sermon in which he shared his recently discovered knowledge with all humankind. The multiple images of the Buddha in Burmese art are excellent examples of this peculiarity in which the Buddha is most frequently shown seated with legs folded; left hand in his lap, palm upward; right hand on his shin, palm inward with fingers pointing toward the earth (bhumisparsa mudra). This hand gesture is symbolic of his overcoming the last obstacle to enlightenment, self-doubt. After years of asceticism and many days’ meditation under the Bodhi tree, the Buddha began to doubt that his past lives had been sufficiently perfect to warrant attaining enlightenment. This was because he believed in rebirth - a belief that the soul, like energy, cannot be created or destroyed, but instead experiences changes only from one form to another. Therefore, the Buddha, like all mankind, had innumerable past lives, all of which would have had to have been lived to perfection if the Buddha was to achieve Nirvana. His difficulty lay in the fact that, like other mortals, he could not remember all his actions in all his former lives. Therefore, he could not be absolutely sure that enlightenment was eminent. By placing his hand on his shin and pointing towards the earth, he summoned the Earth Goddess to come to his assistance. Since in his former lives, the Buddha had participated in the common practice of pouring water on the ground to witness each of his meritorious acts, the Earth Goddess was able to wring a "tidal wave" of water from her hair that had accumulated over the Buddha's many previous lifetimes which was proof of his steadfastness and perfection. 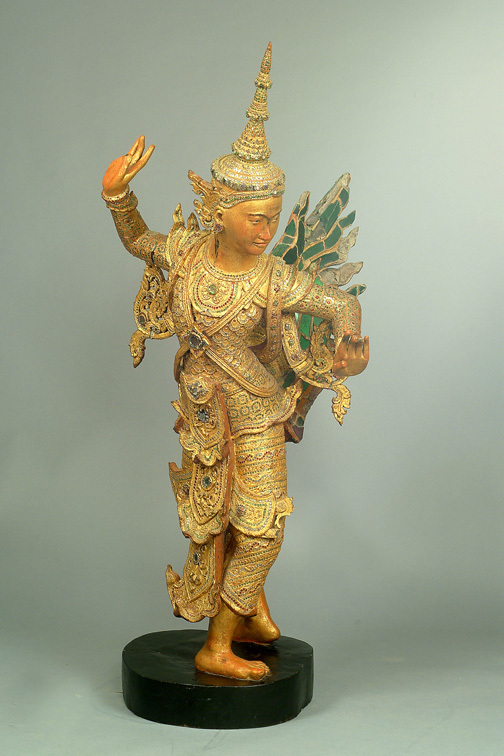 The Earth Goddess (Vasundari - Pali or Wathundaye - Burmese) is presented as a woman wringing water from the tresses of her hair, which constitutes one of the rare instances where women played an important role in the Buddha's life. This role, however, was not trivial. 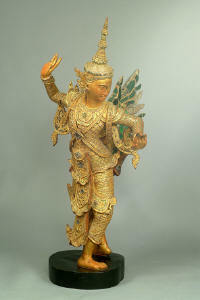 It was of pivotal importance because without her witness and assistance the Buddha would not have gained enlightenment. Since the Buddha's complete enlightenment occurred immediately after "Calling the Earth Goddess to Witness" and since enlightenment takes place within the body without necessarily any outward indication, the iconographic position of "Calling the Earth to Witness" has come to be accepted as representing the enlightenment of the Buddha. To enhance this association, the cranial protuberance (usnisha = cosmic consciousness or supramundane wisdom) and the enigmatic "smile of enlightenment" were also employed. Images of The Buddha seated in bhumisparsa mudra have been endlessly replicated in the art of Burma and Southeast Asia because it is a reminder to all mankind that there is a way to end human suffering. Therefore, as such, the creation of every additional image of the Buddha is a meritorious act that improves the donor's karma. The multiple images of this event stamped on clay votive plaques evidence the zeal of ancient donors who at times created forty or even one hundred images of the Buddha with a single impression of a metal mould. Because of the large number of Buddha images, these plaques were thought to be especially efficacious in assuring the ritual purity and power of a specific site and, therefore, were often placed in underground chambers below the center-most point of the sanctum in a Buddhist building. In Burma, two devotees frequently appear at either side of the Buddha's throne and are identified by the Burmese as his two chief disciples, Mogallana and Sariputta, although their presence at enlightenment is not historically (i.e., canonically) correct. At the time of enlightenment, all the Buddha's friends had abandoned him and it was not until later that disciples came to learn his newly discovered knowledge. The insistence of the Burmese to place these two figures at the feet of the Buddha, from at least the 11th century onward, may be explained in part by the Burmese belief that Buddhism was introduced into Burma during the Buddha's lifetime by two of his disciples. This serves to strengthen Burmese ties to the purest version of the Buddha's message – a particular concern of the Theravada Buddhists - which is considered to have been pure and without corruption during his lifetime - although none of the several names given to the early Buddhist missionaries to Burma is Mogallana or Sariputta. Most Burmese males are expected to join the monkhood at some time during their lives, if only for a brief time. Boys, usually between ages 8 and 13, enter a monastery as a novice after their ceremonial induction or Shinbyu. The entire community is invited to this ceremony, which re-enacts the various stages in the Buddha's life up until the "The Great Renunciation" when the Buddha adopted the restricted regimen of an ascetic (=monk). Ordained Buddhist monks are invited to perform the induction ceremony for a novice and receive gifts of the few necessities allowed them by canonical law. 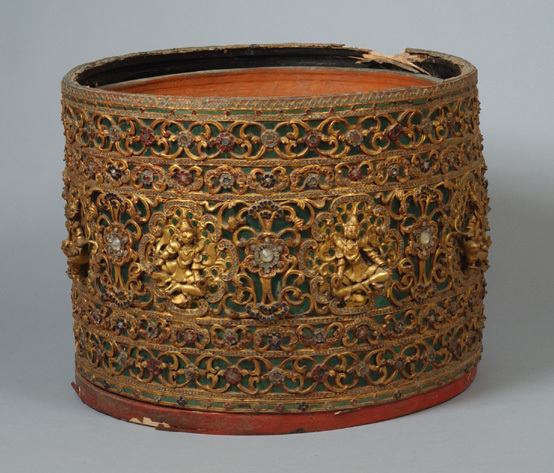 The rules and regulations under which the novice and the monks must live are contained in the Tripitika, excerpts from which are recorded within the Kamawasa, an especially ornate form of Burmese Buddhist manuscript that is produced for use during a Shin Byu ceremony. A new Kamawasa is presented by each novice and is then used to instruct the fledgling novice how to read aloud the Pali language of the Tripitika text, which is a required part of the induction ceremony. The manuscript is then donated to the monastery by the novitiate and his family. When worn out, all items are returned to the head monk for disposal and discarded monk's robes may be used as the foundation from which to make the pages of a Kamawasa manuscript. 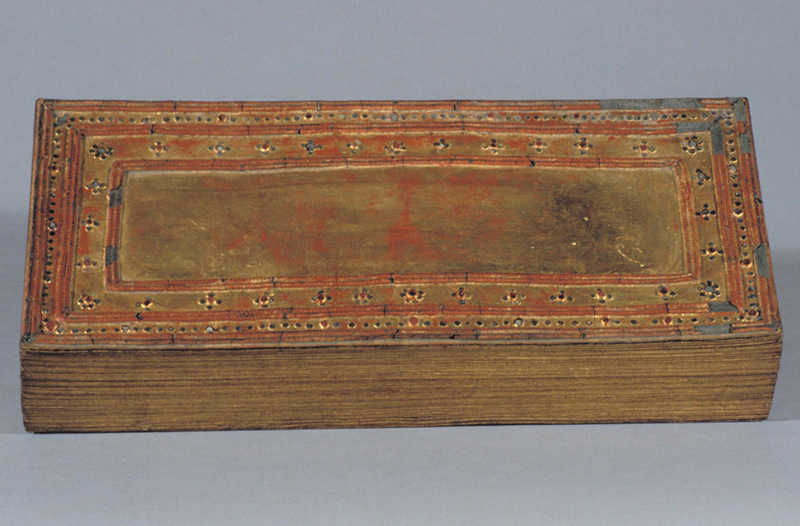 All types of books when not being used were kept in wooden chests to prevent damage from insects, mold, humidity, and light and consequently were among the most valued objects within a monastery. Another composite creature type that combines human with avian characteristics is the Kinnara (male) or Kinnari (female) who appear frequently in adoring pairs and are considered the "love birds" of the Himavanta Forest. It is these creatures that are used to adorn the walls of temples as well as the pulleys that are attached to Burmese looms, which are frequently operated by unmarried girls whose thoughts, when not on weaving, often turn to thoughts of love and their future family. Excellence in weaving is considered a desirable characteristic to attract a husband. An inhabitant of the forest with a normal anatomy is the Hamsa (Hintha - Pali) or brahmani duck, which symbolizes marital fidelity, since this species has a single mate for life. Hamsas hold a branch of fructifying foliage in their beak as a symbol of prosperity and fertility . Among the objects unearthed among the temples at Pagan are three elegant bronze lotus buds held upright on elaborately decorative stems. The eight petals of each open outward to reveal a seated Buddha, a stupa or a shikhakra temple at its center. On the inside of each petal is depicted one of the Eight Great Events in Buddha's life. Similar lotuses have been found in Nepal and Tibet and all were probably used ritually on a temple altar. U Aung Thaw, Historical Sites in Burma (Ministry of Union Culture, Rangoon, 1972, Reprint 1978). Michael Aung Thwin, Pagan: The Origins of Modern Burma, (University of Hawaii Press, Honolulu, ,1985). Michael Aung Thwin, "Jambudipa: Classical Burma's Camelot", Contributions to Asian Studies, Vol, XVI (1981), pp. 38-61. J. Paul Bennett, "The 'Fall of Pagan': Continuity and Change in 14th Century Burma", Conference Under the Tamarind Tree: Three Essays in Burmese History, Yale University Southeast Asia Monograph Series, no. 15 (Yale University Press, New Haven, 1971), pp. 3-53. Charles Duroiselle, "Stone Sculptures in the Ananda Temple at Pagan", Archaeological Survey of India, Annual Report, Delhi, 1913 - 1914, pp. 63 - 67. Charles Duroiselle, "The Ananda Temple at Pagan", Memoire of the Archaeological Survey of India, No. 56, (1931). D.G.E. Hall, Burma, 3rd edition (London, Hutchinson's University Library, 1960). Frederick K. Lehman, "Monasteries, Palaces and Ambiguities: Burmese Sacred and Secular Space", Contributions to Indian Sociology, Vol. XXI/I (1987), pp.169-86. U Lu Pe Win, Pictorial Guide to Pagan (Ministry of Union Culture, Rangoon, 1955. Reprinted 1975). G.H. Luce, "The Greater Temples of Pagan", Journal of the Burma Research. Society, Vol. VIII/3 (1918), pp. 189-98. Reprinted in Fiftieth Anniversary Publication, Vol 2 (Rangoon, 960), pp189-198. G.H. Luce, "The Smaller Temples of Pagan", Journal of the Burma Research Society, Vol. X/2 (1920), pp. 41- 8. Reprinted Fiftieth Anniversary Publication, Vol. 2 (Rangoon, 1960), pp.179-190. Pratapaditya Pal, "Fragmentary Cloth Paintings From Early Pagan And Their Relations with Indo-Tibetan Traditions", in Donald M. Stadtner, ed., The Art of Burma New Studies ( Marg Publications, Mumbai, 1999), pp. 79-88. Pierre Pichard, Inventory of Monuments at Pagan, Vols. I –VII (Kiscadale Publications, Gartmore, 1993). Pierre Pichard, The Pentagonal Monuments of Pagan (White Lotus, Bangkok, 1991). Paul Strachan, Pagan: Art and Architecture of Old Burma (Kiscadale, Arran, Scotland, 1989).